The cause of this error is most likely that you are trying to install Django 2.0 using an unsupported version of Python, e.g. Python 2.7. To solve this problem you can either use Python 3.4 or newer or install a version of Django that is compatible with your version of Python. If you are using Python 2.7, this would be Django 1.11, at the time of writing 1.11.9. Note that we specified 1.11. *, not 1.11. This ensures that we get the latest patch release version of Django 1.11 containing bugfixes and security patches. This issue has been fixed in Django 2.0.1 by adding the python_requires directive to setup.py. 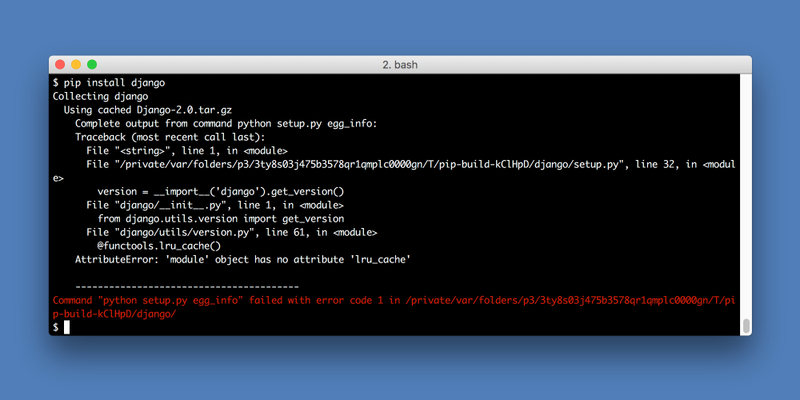 It ensures that pip won’t even try to install versions of Django that incompatible with your current version of Python. Unfortunately, this fix cannot be applied to Django 2.0 retroactively, so we are stuck with this error message until the last Django user has migrated away from Python 2.7.